CRE sales in Frederick County, Maryland ended on a solid note for 2018. Total sales of all land and commercial transfers for the quarter exceeded $78.5 million, which is 138% greater than the $32.9 million of 2017. Out of the quarter’s 40 transactions, the top 5 transactions dominated 74% of the total sales volume with $58 million. Crocker & Little Properties divested themselves of the four multifamily buildings located on the southwest corner of James and West Patrick Streets on the west end of The City of Frederick. With approximately 30 units, the 1.2 acres that made up the 2 parcels containing 35,000 +/- SF of structures built and renovated by the long-established building and investment business sold on December 4th for $3,000,000 to a group named Mountain View Apartments LLC. Natelli Communities’ Tom Natelli with his patience for bringing high quality employment to his Urbana Office park landed the feature of last week’s MacRo Report Blog post, with the November 16th sale of 20 acres on Bennett Creek Boulevard for $7,500,000. The buyer, Kite Pharma, is a California based drug company that focuses on cutting edge cancer research and treatments. It expects to bring around 900 new jobs to the county. The firm plans a 280,000 square foot facility there. The official announcement will come later this year from County Executive Jan Gardener. 260 Interstate LLC, a partnership of a couple of long-time Frederick County residents, registered the second largest warehouse deal of the year with the sale of a 20-year old 107,000 square foot structure in the Industrial Center East park. Colonial Sash and Window has been its primary tenant for almost that long. The sale took place on November 7th at a price of $9,225,000. Craig Ruppert established a new entity to acquire the Westview Corporate Center at 5280 Corporate Court in the Westview Office Park. 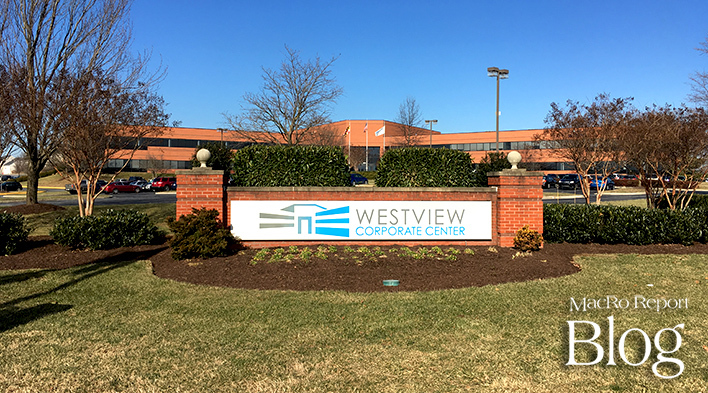 RP Westview LLC purchased the 213,000 SF 2-story office building on 16.9 acres on December 10th, at the price of $16,491,000 or $77.34 per square foot. The building was a former bank call center, and over the last several years, it has struggled with significantly high vacancy rates. Knowing the Ruppert Company’s aggressive knack for filling up space, it won’t be long before 5280 will be fully occupied! Natelli Communities landed the largest transaction of the fourth quarter, with the recording of a deed consisting of 199 acres made up of multiple adjoining parcels of land … and just a stone’s throw to the southeast from the deal it made with Kite Pharma. This time, after many months of pursuit, last June, Natelli received all the necessary county approvals for a 566-unit, age-restricted residential community. Known as The Woodlands at Urbana, once developed, the project will have frontage on MD RT 355 and Urbana Parkway. Natelli’s acquisition was made by Urbana Active Adult LLC at a price of $22,000,000. Without a doubt, the project will be a quality community. Keep an eye out for a summary of the all 2018 transactions in the coming weeks. We’ll dissect this year’s record-breaking sales by product types, average price per square foot and more; then compare all that to previous years, so you can see how Frederick County’s land and commercial market continues to grow! Rocky Mackintosh, President of MacRo, Ltd., a Land and Commercial Real Estate firm based in Frederick, Maryland, has been an active member of the Frederick community for over four decades. He has served as chairman of the board of Frederick Memorial Hospital and as a member of the Frederick County Charter Board from 2010 to 2012. He currently serves as chairman of the board of Frederick Mutual Insurance Company. Established in 1843, it is one of the longest enduring businesses in Frederick County. That’s a nice list of deals. Looks like you guys are pretty busy on the investment side of CRE. Must be fun putting those kinds of deals together.